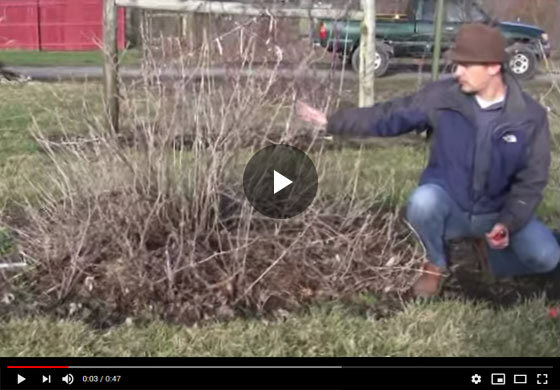 Felix, Gurney's horticulture expert shows off two currant plants and demonstrates the differences in the growth pattern and productivity of a well managed and a wild, uncared for plant. Hi everyone, Felix here with Gurneys and today we're talking about currant, and I want to show you what you can do with the currant to help harvest and to help cope for your cultural practices with it and here on my right is a currant on its own, growing in its natural form, with no manipulation. It's a sprawling plant, looks very healthy and everything. We have a lot of canes that are growing downward into the soil area, some are actually rooting there. You have vertical growth, but the problem with this, is when all these fan flower buds load up with fruit, they're just going to hang down into your soil area, and so it's a tough one to manage, for that point. And here on the left is one we've trained to more of a vertical fan system which we'll show later, how to get it to this point. But you can see, low growth isn't happening and better air circulation, no disease problems, and picking is easier and the canes aren't going to fall over. So we're going to cover how to train these two--this is an example of natural, no care, and some training. And we'll also show you how that manifests when the fruiting season is upon us, and you can see how much easier it is to harvest as well. So join us for those follow-up videos on growing some currants. Thanks very much.